Background: Chronic hepatitis B is a global public health problem. Histological staging of liver fibrosis is crucial to identify patients who need antiviral treatment. Correlation between perspective markers and liver fibrosis has been studied by current research. Methods: Samples of blood were collected from 75 persons non-infected and 75 infected cases with HBV were classified according to Metavir system. ELISA technique is used to determine alternative markers levels. RT-PCR assay is used to quantify HBV DNA. Scoring systems are compared to non-invasive markers. Results: Our research has guided us that Hyaluronic acid, COMP and Coll-IV and scoring indexes of fibrosis discriminate fibrosis cases from non-fibrosis group. The studied biomarkers' results differentiate early stages from advanced levels of fibrosis. Conclusions: We expect that if these alterative biomarkers are combined with scoring system, they would be beneficial predictors to determine fibrosis levels in liver in order to eliminate needing to liver biopsy. Non-invasive biomarkers, Hepatitis B, Liver fibrosis, METAVIR, Fibrosis scoring systems. ECM: Extracellular Matrix, COMP: Cartilage Oligomeric Matrix Protein, AST: Aspartate aminotransferase, APRI: AST to Platelet Ratio Index, FIB-4: Fibrosis-4 score, PLT: Platelets, ROC: Receiver Operating Characteristic, AUC: Area Under the Curve, ALT: Alanine Aminotransferase, PPV: Positive Predictive Value, NPV: Negative Predictive Value; BMI: Body Mass Index; NAFLD: Non-Alcoholic Fatty Liver Disease, HBV: Hepatitis B virus, HSC: Hepatic Stellate Cells, HA: Hyaluronic Acid, CO-IV: Collagen type four, IFG: Impaired Fasting Glucose. Inevitably, searching for precise alternatives to liver biopsy is actually required for hepatologists and patients over the world. The chronic diseases of liver in increasing more than declining and that is considered as main causes of mortality . Hepatitis B virus is an etiological reason of chronic liver disease such as fibrosis. For accurate diagnosis and treatment, histological and levels of fibrosis should be defined before any intention to begin in any type of therapy . Biopsy of liver has practical role in estimation and diagnosis of fibrosis levels as well as assessment of another several diseases such as inflammation, steatosis and necrosis. Nevertheless, it is mostly a risk which causes suffering of severe pain and complication after operation which includes mortality in about 0.1% of cases in addition to long stay at hospital under observation in around 5% of patients . Also, for implementation of biopsy, 1-2 pieces of 1 cm tissue as 1/50,000 of the volume of liver might be insufficient in estimation . In advanced stage of liver disease, sampling error in detection cirrhosis is detectable in up to 20 percent of cases . Most importantly, Biopsy is beside its effective role in monitoring the response of patients to treatment and assessment of progression of fibrosis but by its repletion time is described as risk and impractical technique which leads to more complications to cases . As a consequence for these reasons, looking for alternative techniques particularly noninvasive planning can be repetitive and effective in assessment of liver fibrosis as well as screening treatment response and detecting early stages of diseases. The scoring system of METAVIR was projected especially for patients who were co-infected hepatitis C virus using a sum of experience-based suggestions of a number of pathologists who boosted by sequent stepwise discriminated analysis . The degree and stage of fibrosis include to couple of classified scores divided into one for necroinflammatory degree and other for fibrosis level (F). The activity of inflammation is defined by A1 to A4 which are described the severity of activity. An assessment of inflammation degree is a valuable in correlation with hepatic fibrosis. This assessment of activity degree is fully relied on integration of necrosis degree by using simple algorithm . Fibrosis of live is graded into several levels from F0 (healthy) to F4 (progressive liver scare) . The improvement of inter and intra variability of METAVIT is observable . The Metavir characterises by feasibility, specificity on necroinflammatory lesion and fibrosis. The profitability, attraction, and availability of serum markers which are used to determine fibrosis levels are pivotal for clinicians and patients as well. Above all, they are excellent alternatives due to their availability in repetition time which is practical in monitoring of fibrosis dynamically . COMP is an extracellular matrix (ECM) protein primarily present in cartilage and encoded by the COMP gene. It is a non-collagenous protein mostly identifiable in cartilage which contains of five arms 435 kD . It is considered a potential biomarker which interacts with collagen and is suggested to have a role in regulating fibril assembly as well as a structural role for maintaining the mature collagen network. HA is known as a glycosaminoglycan which is a vital substance of extracellular matrix is found in a highest concentration in fluid such as joint and eyes . Nowadays, it has been performed as an effective biomarker of hepatic fibrogenesis in cases who suffer from chronic viral disease . Type IV collagen is a component of ECM that was investigated as a surrogate marker of liver fibrosis . It has three different regions (an aminoterminal domain, a central helix domain, and a carboxyterminal domain) . Type IV collagen has been studied extensively in liver diseases of different etiologies. The rate of endorsement of different indirect markers in evaluation of liver fibrosis is diverse in several countries over the world and bordered . We have aimed to evaluate an efficiency of alternative noninvasive markers which include Coll-IV, COMP and HA as well as scoring systems: APRI, NAFLD, FIB-4 and SHASTA to detect fibrosis stages in HCV cases. Required amounts of blood samples were drawn by specific needle after an overnight fasting from totally 150 blood samples from 75 infected HBV patients who was had who had been excluded from 280 cases. Meanwhile, ten ml blood sample were collected from 75 healthy volunteers were obtained from hospital of Mansoura university in Mansoura, Egypt and assessed by ultrasound techniques. These samples were separated and used for their planned purposes. The retrospective analysis covered the period between July 2017 and January 2019 inside the hospital laboratory department. This operation has been implemented by Menghini's technique aspirating needle set. Expert pathologists examined the tissues of biopsy and then they have determined liver fibrosis stages according to METAVIR classification. These tests include Platelets count, AST, ALT, Albumin levels and fasting blood glucose. Serum HCV RNA was detected by Real Time PCR assay. Hyaluronic Acid, Comp and Collagen-IV levels have been determined by commercially ELISA kits. APRI: It is calculated by using platelets count and AST by measuring the ratio between them. FIB-4: It is a score which includes platelet count, ALT, AST levels and age. NAFLD: It is a score system depends on specific equation which includes age, FBS, BMI, PLT count, ALB, and ratio between ALT and AST. SHASTA Index: It is calculated by using panel of HA, AST and ALB. BMI Kg/M2: Calculated by using equation between height and weight. IFG: It is calculated by WHO consideration of FBS level from 110 to 125 mg/dL is IGF . Particular software version of IBM SPSS is exploited in insertion of data into computer to be analysed (Armonk, NY: IBM Corp) . Number and percentage were described by qualitative data. The normality of distribution Quantitative data which is verified by The Kolmogorov-Smirnov test and that helps in description of using range (minimum and maximum), mean, standard deviation and median. Significant results were approved at the 5% level. Comparison between different groups is implemented by using of Chi-square test. Normally distributed quantitative variables are presented by Student ttest which helps in comparison between two studied groups. Normally distributed quantitative variables are performed by using of F-test (ANOVA) which assists in distinguish between more than two groups. Differentiation of abnormally variables are elaborated by using of Mann Whitney test and compare between studied groups. Abnormally variables are presented by using of Kruskal Wallis test which helps in comparison between studied groups. 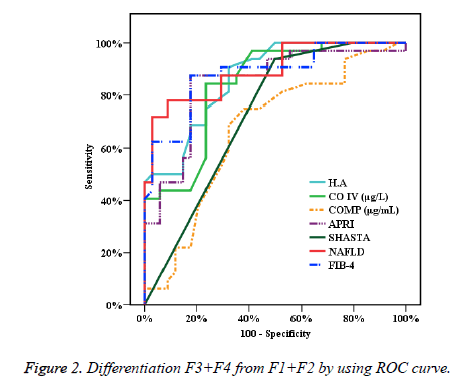 In Figure 1, the precision of particular studied markers tests is presented by ROC curve which helps to discriminate cases with fibrosis of liver from healthy. The areas under curve (AUROC) of HA (0.988), CO-IV (0.870), COMP 0.965 , APRI 0.1.000 , SHASTA 1.000 , NAFLD 1.000 and FIB-4 1.000 are helpful in detection of different stages of fibrosis. The results illustrate cut off for HA, CO-IV, COMP (>36, >98.1, >15) respectively and the accuracy is (94.33, 92.2, 92.91) respectively too. The comparisons between the AUC of the calculated studied algorithm (APRI, NAFLD, FIB4 and SHASTA) and the AUC of the studied markers HA, CO-IV and COMP levels are presented and calculated presented in Table 1. By understanding of highlights of these reports, the accuracies of these markers are observable. Figure 1. Discrimination liver fibrosis from control by using ROC curve. Table 1. Presentation of sensitivity and specificity and accuracy. In Figure 2, the accuracy of specific studied biomarkers tests is performed by ROC curve which helps to exclude initial levels of liver fibrosis first and second stages from progressed liver fibrosis (F3 and F4). Thence, the areas under curve (AUROC) are presented by mentioned figure which describes that HA (0.866), CO-IV (0.838), COMP (0.668), APRI (0.844), SHASTA (0.725), NAFLD (0.893) and FIB-4 (0.880) and these reports helps definitely to discriminate several levels of fibrosis. The results elaborate the cut off for HA, CO-IV, COMP (>123, >163, >21) respectively, and the accuracy is (78.79, 80.30, 68.18) respectively too. In comparison of the AUC of the studied calculated systems (APRI, NAFLD, FIB4 and SHASTA) to the AUC of the studied biomarker Hyaluronic Acid. On the other hand, the AUC of CO-IV and COMP were measured and the results are described profoundly in Table 2. By perceiving of highlights of these reports, the low accuracy of COMP test was noticeable. Table 2. Presentation of sensitivity and specificity and accuracy. The plan of antiviral therapy includes specific patients who have fibrosis of cirrhosis, to eradicate or eliminate the consequence complications . Our studied scoring systems are regarded as good non-invasive markers which are massively demanded to clinical works as well as they are considered as perfect alterative to biopsy. Also, these indexes can be used in screening of treatment efficiency . The AUC of FIB-4 resulted 0.85, 0.81 in perfect evaluation of several levels of fibrosis in HBV cases . The accuracy of FIB-4, NAFLD and APRI are performed as great detectors of levels of fibrosis [23,24]. Fortunately, these results of these researches are agreed with our research. In another study, the precision of COMP in evaluating cirrhosis was as excellent as another scoring systems with (AUC 0.884), sensitivity 83.3% and specificity 83.7% (cut-off 11.5U/L). The results of COMP searches showed that it is a good noninvasive marker in comparison with specific fibrosis indexes such as APRI and FIB-4. Thereafter, to prove comp test as a valid detector to evaluate fibrosis, the more studied are required . In our study, accuracy of discrimination of COMP in evaluating cirrhosis was (AUC 0.965) with sensitivity 84.85% and specificity 100.0%, (cut-off >15U/L) and accuracy (92.91) in ROC curve for diagnosis liver fibrosis from control. Moreover, in Figure 2 showed that the results of COMP was (AUC 0.668) with sensitivity 75.0%, specificity 61.76% with cut-off >21U/L and accuracy (68.18). Figure 2. Differentiation F3+F4 from F1+F2 by using ROC curve. By using ROC curve in current study, APRI index performed the good results which are beneficial to discriminate early stages and advanced levels of fibrosis in parallel to classification of METAVIR score, whereas APRI showed AUC 0.844, COLL-IV and HA performed AUC 0.838 and AUC 0.866 respectively. By studying of NAFLD, the reports performed that Hyluronic acid was found a perfect marker in fibrosis detection whereas AUC 0.97 . Otherwise, HA has effective ability to distinguish advanced levels from initial stages of fibrosis by its results of NPV (98-100%) which is higher than PPV (61%) . Recently by researches, several indirect non-invasive markers are reviewed in detection of progressed levels of fibrosis of liver in infected cases with different liver diseases . The NAFLD fibrosis score is presented as the most well and a validated model in discrimination of patients who have advanced fibrosis stages from whom without fibrosis . The NAFLD fibrosis score depend totally on using 6 variables and was advanced in an early study including 75 patients for purposes. The test performed well with AUROC of 1.000 and 0.893 in studied groups. In the HBV group, progressive fibrosis could be discriminated and diagnosed by a NPV of 81.6% for patients with score >1.208 and a PPV of 89.3%. Using these cut-offs which approve that a biopsy could be avoided in 89% of patients tested with only a 10% false prediction rate. Various AUROC of APRI (0.844-1.000), FIB-4 (0.880-1.000) and SHASTA (0.725–1.000) have provided and effective indicators in detection of advanced fibrosis as mentioned. Overall, as a result of current study, a good accuracy of non-invasive fibrosis scoring systems tests such as APRI 84.85, SHASTA 71.21, NAFLD 84.85 and FIB-4 84.85 provides a significant evidence to consider these algorithm parameters as excellent predictors for exclusion of advanced fibrosis and differentiate between milder forms of fibrosis. SHASTA index is fully relied on several variables such as serum Hyaluronic acid, AST, and albumin. By current study of 75 HBV co-infected patients, this index performed that a sensitivity of 100.0% and a NPV of 100.0%, to discriminate liver fibrosis from control as well as showing a sensitivity of 93.75% and a PPV of 89.5% provide assistance to exclude liver fibrosis stages F1+F2 from F3+F4 of patients . Hence, the results of studied biomarkers have presented potential evidence to consider these markers are pivotal predictors to distinguish cases without fibrosis from patients with several levels of fibrosis from early, mild and advanced stages. In summary, Alternative biomarkers which are including H.A, CO-LIV and COMP are considered as prospective markers to differentiate healthy individuals from chronic liver disease by their significant results in fibrosis detection. Thence, if serum H.A, CO-IV, SHASTA, COMP, and comparative indexes of fibrosis system are measured together, it would be precise criterion of liver fibrosis detection rather than liver biopsy. The authors hereby declare that they have no competing interests. Authors and corresponding authors have reviewed this paper and approved it for publication. All study materials were supplied by Corresponding author. There was no further funding for this study. Authors completed the study protocol and were the main organizer of data collection drafting and revising the manuscript perfectly. Tamer A. Addissouky has written the article and guarantees the paper carefully. All authors contributed to the discussion and reviewed the manuscript as well as they helped in designing the study and protocol and engaged in a critical discussion of the draft manuscript. All authors have affirmed on the final copy of the manuscript. We would like to thank all the outer Clinics of Mansoura University hospitals staff and the laboratory teams that cooperated voluntarily in the study. I thank supervisors for enhancing all the practical support to the study. Finally, we thank all patients for providing all the samples which supported the study. All data are available and sharing is available as well as publication. Williams R Global challenges in liver disease. Hepatology 2006; 44:521-526. Myers RP, Fong A, Shaheen AA. Utilization rates, complications and costs of percutaneous liver biopsy: a population-based study including 4275 biopsies. Liver Int 2008; 28:705-712. Terjung B, Lemnitzer I, Dumoulin FL, Effenberger W, Brackmann HH, Sauerbruch T, Spengler U. Bleeding complications after percutaneous liver biopsy. An analysis of risk factors. Digestion, 2003; 67:138–145. Regev A, Berho M, Jeffers LJ, Milikowski C, Molina EG, Pyrsopoulos NT, Feng ZZ, Reddy KR, Schiff ER. Sampling error and intraobserver variation in liver biopsy in patients with chronic HCV infection. Am J Gastroenterol 2002; 97:2614-2618. Rockey DC, Caldwell SH, Goodman ZD, Nelson RC, Smith AD. Liver biopsy. Hepatol 2009; 49:1017-1044. Bedossa P, Poynard T. An algorithm for the grading of activity in chronic hepatitis C. The METAVIR Cooperative Study Group. Hepatol 1996; 24:289-293. Poynard T, Hepatitis B, Hepatitis C. A Martin Dunitz Book 1. Taylor & Francis, United Kingdom. Management and treatment 2002. Franciscus A. HCV Diagnostic tools: Grading and staging a liver biopsy. HCSP 2010; Version 2.4. Poynard T, Ratziu V, Benmanov Y, Martino VD, Bedossa P, Opolon P. Fibrosis in patients with hepatitis C: Detection and significance. Semin Liver Dis 2000; 20:47-56. Zhou K, Lu LG. Assessment of fibrosis in chronic liver diseases. J Dig Dis 2009; 10:7-14. Gressner OA, Weiskirchen R, Gressner AM. Biomarkers of liver fibrosis: clinical translation of molecular pathogenesis or based on liver dependent malfunction tests. Clin Chim Acta 2007; 381:107-113. Takyar V, Surana P and Kleiner DE. Noninvasive markers for staging fibrosis in chronic delta hepatitis. Aliment Pharmacol Ther 2017; 45:127-138.
WHO Guidelines Approved by the Guidelines Review Committee, Guidelines for the World Health Organization. Prevention, Care and Treatment of Persons with Chronic Hepatitis B Infection. Geneva: 2015. Martinez SM, Crespo G, Navasa M and Forns X. Noninvasive assessment of liver fibrosis. Hepatol 2011; 53:325-335. Crossan C, Tsochatzis EA, Longworth L, Gurusamy K, Davidson B, Rodriguez P. Cost-effectiveness of non-invasive methods for assessment and monitoring of liver fibrosis and cirrhosis in patients with chronic liver disease: systematic review and economic evaluation. Health Technol Assess 2015; 19:1-409. Baranova A, Lal P, Birerdinc A and Younossi ZM. Non-invasive markers for hepatic fibrosis. BMC Gastroenterol 2011, 11:91. Nichols GA, Hillier TA, Brown JB. Progression from Newly Acquired Impaired Fasting Glusose to Type 2 Diabetes. Diabetes Care 2007; 30:228-233. Kirkpatrick LA, Feeney BC. A simple guide to IBM SPSS statistics for version 20.0. Student ed. Belmont, Calif.: Wadsworth, Cengage Learning, 2013. Lavanchy D. Hepatitis B virus epidemiology, disease burden, treatment, and current and emerging prevention and control measures. J Viral Hepat 2004; 11:97-107. Sebastiani G, Vario A, Guido M and Alberti A. Sequential algorithms combining non-invasive markers and biopsy for the assessment of liver fibrosis in chronic hepatitis B. World J Gastroenterol 2007; 13:525-531. Mallet V, Dhalluin-Venier V, Roussin C, Bourliere M, Pettinelli ME, Giry C, Vallet-Pichard A, Fontaine H, Pol S. The accuracy of the FIB-4 index for the diagnosis of mild fibrosis in chronic hepatitis B. Aliment Pharmacol Ther 2009; 29:409-415. McPherson S, Stewart SF, Henderson E, Burt AD, Day CP. Simple non-invasive fibrosis scoring systems can reliably exclude advanced fibrosis in patients with non-alcoholic fatty liver disease. Gut 2010; 59:1265-1269. Shah G, Lydecker A, Murray K, Tetri BN, Contos MJ, Sanyal AJ. Comparison of noninvasive markers of fibrosis in patients with nonalcoholic fatty liver disease. Clin Gastroenterol Hepatol 2009; 7:1104-1112. Zachou K, Gabeta S, Shums Z, Gatselis NK, Koukoulis GK, Norman GL and Dalekos GN. COMP serum levels: A new non-invasive biomarker of liver fibrosis in patients with chronic viral hepatitis. Eur J Intern Med 2017; 38:83-88. Lydatakis H, Hager IP, Kostadelou E, Mpousmpoulas S, Pappas S, Diamantis I. Non-invasive markers to predict the liver fibrosis in non alcoholic fatty liver disease. Liver Int 2006; 26:864-871. Castera L, Vilgrain V, Angulo P. Noninvasive evaluation of NAFLD. Nature Rev Gastroenterol Hepatol 2013; 10:666-675. Angulo P. The NAFLD fibrosis score: a noninvasive system that identifies liver fibrosis in patients with NAFLD. Hepatol 2007; 45:846-854. Kelleher T, Mehta S, Bhaskar R. Prediction of hepatic fibrosis in HIV/HCV co-infected patients using serum fibrosis markers: the SHASTA index. J Hepatol 2005; 43:78-84.